HM The Queen Elizabeth II. An official photograph, taken at Buckingham Palace by Terry O'Neill, an English photographer, in 1992. The engraving from the official photograph, taken at Buckingham Palace by Terry O'Neill, an English photographer, in 1992. King George IV started a practice in the British royal family which continues today: the awarding of family orders. These are diamond-set portraits of the monarch suspended from a silk bow (the color varying by reign), and they are today given to female royal family members of the sovereign's choosing as a personal gift. 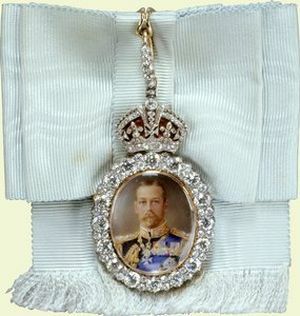 Queen Elizabeth was first given her grandfather George V's order, set on pale blue silk. 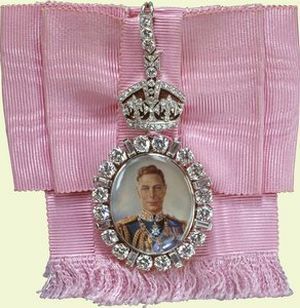 Followed by her father George VI's, on pink silk, and she wears them both today. (A royal lady can wear all the family orders she has at once.) The orders are positioned on the left shoulder. They are worn for the most formal events, and can usually be seen on the Queen when she's at a tiara event. 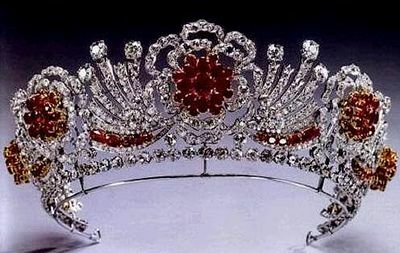 Commissioned by the Queen from Garrard in 1973, this tiara includes two of the Queen's wedding presents: rubies from Burma, and diamonds taken from the Nizam of Hyderabad Tiara. 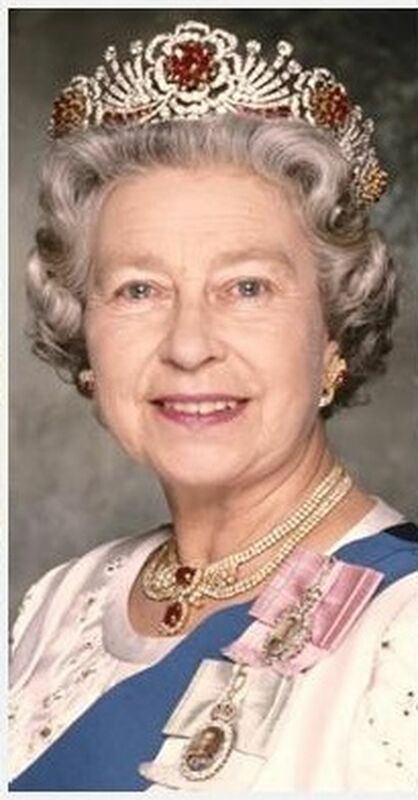 It was the only ruby tiara the Queen used until the Oriental Circlet came into her possession following the Queen Mother's death. ("From her Majesty's Jewel vault"). The Ruby and Diamond Swag Demi-Parure. Another of the modern sets of jewelry owned by the Queen is this demi-parure of a necklace and earrings in rubies and diamonds. 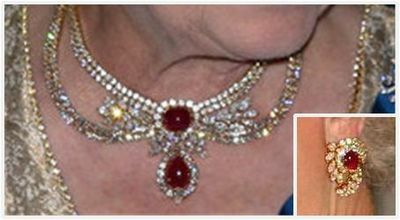 The necklace is a diamond swag design set in gold and centered around 2 large rubies. The matching earrings each include a central ruby set in a diamond swirl. In lower left corner is Bank of Bahamas logo. 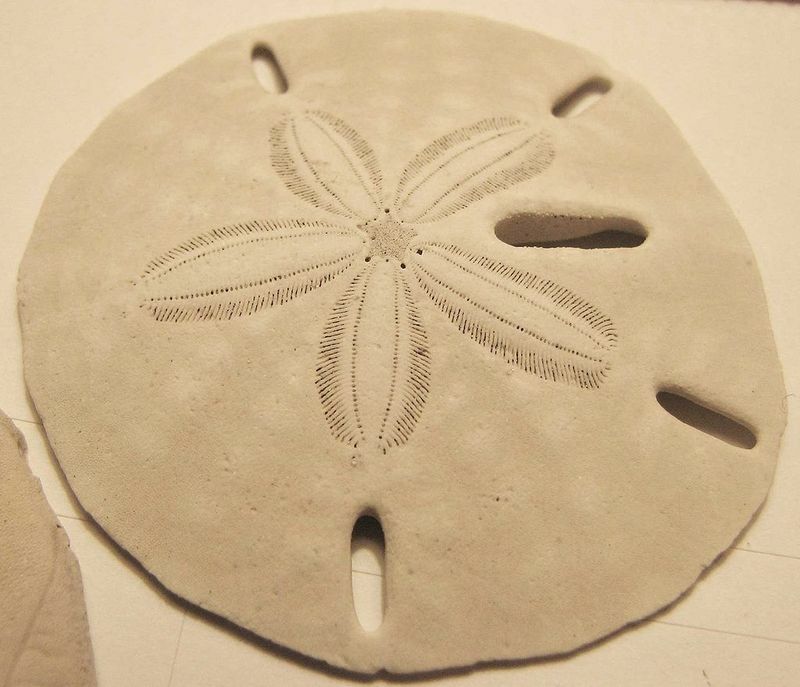 It is Mellita quinquiesperforata or Keyhole Sand Dollar - a tropical species of sand dollar, a flat, round marine animal related to sea urchins, sea stars, and other echinoderms. The selection of the sanddollar as the logo of the Central Bank was made by the first Governor, Mr. T. B. Donaldson, who, in addition to wanting something Bahamian, was "intrigued by the elegance and history" of this unusual specimen of marine life, of which an interesting legend exists. The markings on the shell of the sanddollar are said to symbolize the birth, crucifixion and resurrection of Christ". Centered is the flower of Bahama Strongbark (Bourreria succulenta) (also, right of the Queen, on background). Large shrub or small tree with spreading branches that droop toward the tips. Trunks erect, about 2-6 inches in diameter. Bark thin, light brown tinged with red, slightly roughened. Leaves smooth, shining, about 2-3 inches long. The leaves can be hairy or even rough when plants are immature, sometimes leading this to be misidentified as the very rare B. radula. 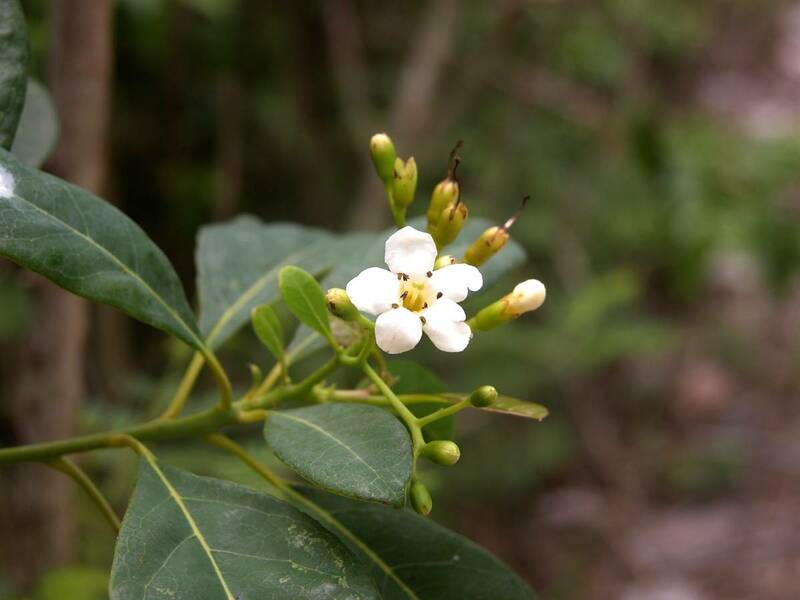 The Bahama Strongbark tree is great for accents or specimen flowering shrubs. It can make for a visually appealing tree as its branches have a droopy, cascading aspect to them. This tree is native to south Florida, South America,and the West Indies. The fruit of the Bahama Strongbark consists of bright orange to red round 1/2" drupes, and is considered to be a rare large shurb to small tree with spreading branches. The Bahama Strongbark is very attractive to wildlife, such as the Bahamian Swallowtail, Giant Swallowtail, Julia, Large Orange Sulphur, Mangrove Skipper, Southern Broken-dash Skipper and other butterflies. Near HM The Queen is hologramm, changing color by tilt of banknote, lizard. In my opinion it is the northern curly-tailed lizard (Leiocephalus carinatus). It is native to the Bahama Islands, the Cayman Islands, Cuba, and Honduras, but also was released intentionally in Palm Beach, Florida, in the 1940s in an attempt to control sugar cane pests. Adults may attain a snout to vent length (SVL) of 10.5 cm. (4.1 in. ), or a total length, including the tail, of 26 cm. (10 in.). The dorsal scales are keeled and pointed. 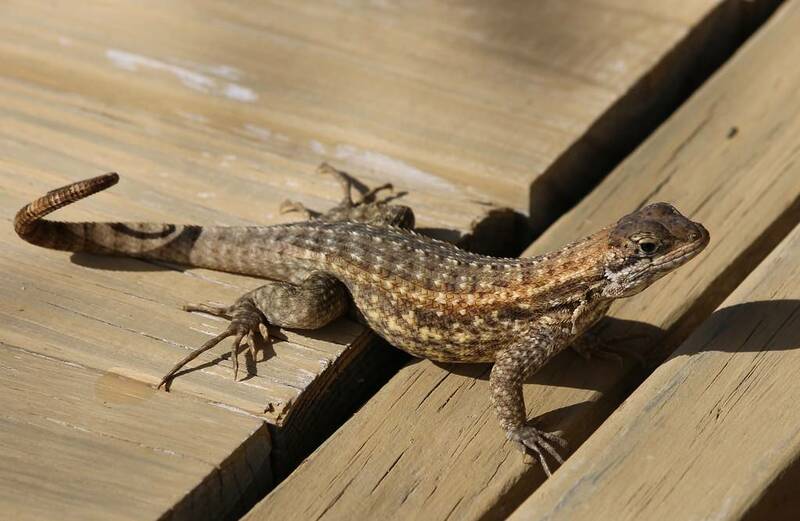 L. carinatus resembles lizards of the genus Sceloporus, but with the tail usually curled upward, especially when the lizard is in a horizontal position on rocks or on the ground. On the background is a map of Bahamas. 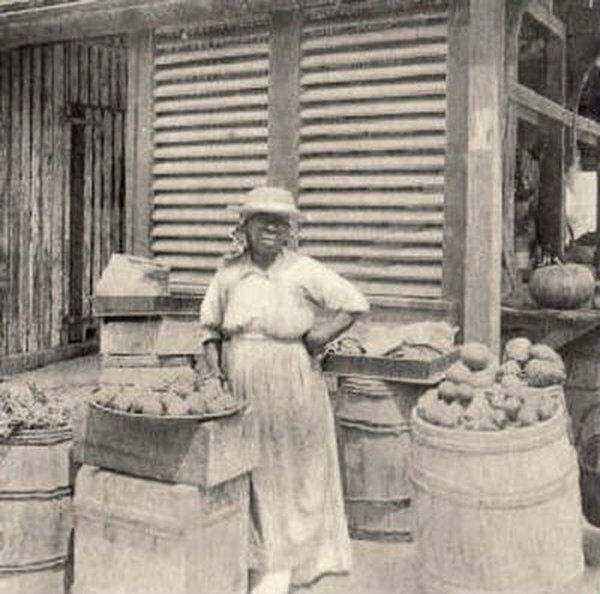 The Seller - sister Sarah Johnson at Nassau market (in the food row). According to Paul Walters, "Sister Sarah is indeed a real person. She was a prominent figure at the straw market in the 1970s, when the market was located along the dock--before it moved to its present day location on Bay street". The art of straw work weaving is alive and well on Harbour Island and North Eleuthera. 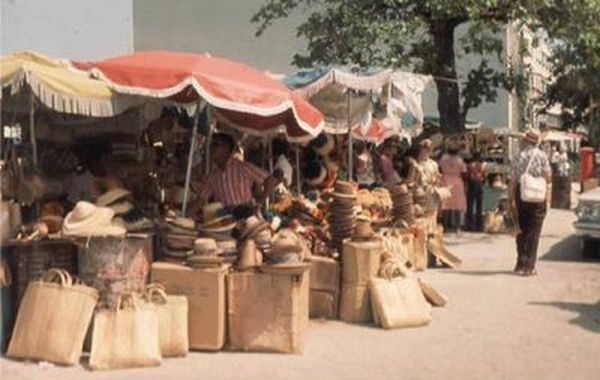 These baskets, hats, dolls and mats are made to be sold in the local shops and straw markets of Nassau, Freeport and overseas. Miz Curline Higgs, Miss Eva Mather, Sister Sarah Johnson and Miz Jacquelyn Percentie of Harbour Island are a few of several local artisans who have mastered the art of weaving these beautiful items, and who continue to sponsor up-and-coming younger weavers from the neighboring settlements as they continue the tradition. On the right side, at the bottom, are the straw baskets and rug at Straw Market. For straw products, read the description of 50 Cents notes in earlier editions. Also, above straw baskets are the customers at Bahamas straw market. 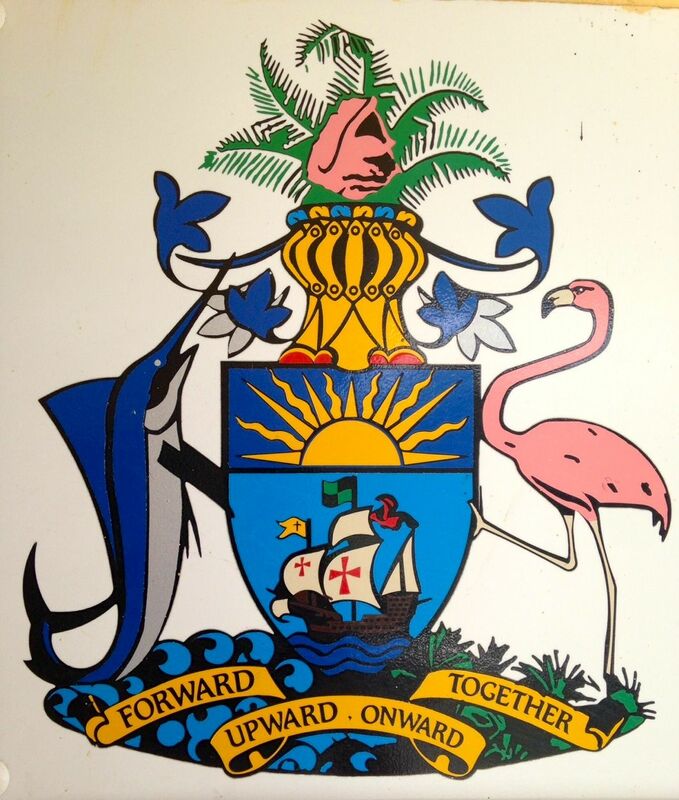 The Coat of Arms of the Bahamas is at the bottom. It contains a shield with the national symbols as its focal point. The escutcheon (shield) is supported by a marlin and flamingo. The crest on top of the helm (helmet) is a conch shell, which represents the varied marine life of the island chain. Below the helm is the escutcheon itself, whose main charge is a ship, reputed to represent the Santa Maria of Christopher Columbus. It is sailing beneath a sun in the chief. The animals supporting the shield are the national animals, and the national motto is found at the bottom. The flamingo is located upon land, and the marlin upon sea, indicating the geography of the islands. The vibrant tinctures of the coat of arms are also intended to point to a bright future for the islands. They are also reputed to have been maintained for their attractiveness to tourists. The Coat of Arms was approved by Her Majesty, Queen Elizabeth II on 7 December 1971 for use by the Bahamian People and the Commonwealth of The Bahamas. It was designed by Bahamian artist and clergyman, Rev. Dr. Hervis L. Bain, Jr., who is also a Member of the Order of the British Empire. On top is, again, logo of the Bank of Bahamas. Mr. Rolle was appointed Governor of the Central Bank of The Bahamas, in January, 2016. During the three years leading up to this, he served as the Financial Secretary in the Ministry of Finance. There, he spearheaded the implementation of the Government’s fiscal reform initiatives, which included the introduction of valued added tax (VAT), strengthening of tax administration systems and enhancing expenditure control frameworks. From 2009 to 2012, Mr. Rolle was seconded to the Executive Board of the International Monetary Fund (IMF) as a Senior Advisor to the Executive Director for Canada, Ireland and the Caribbean Constituency. In this role, he was a principal advisor on economic policy matters, supporting advocacy on behalf of Caribbean countries. The Governor has returned to the starting point of his career in central banking. From 1990 to 2012, he was employed in various capacities at the Bank, progressing up the ranks of the Research Department. 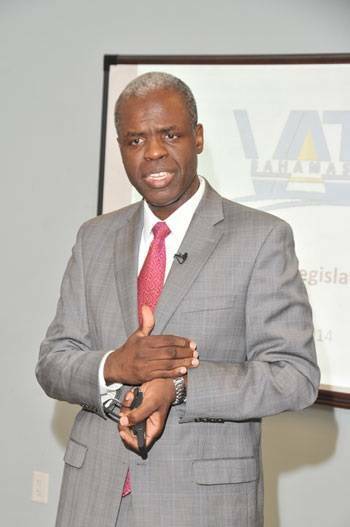 The Governor has also contributed as an Adjunct Lecturer, in Economics, at the American University (2008) in Washington, DC, and, for many years, as a Part-Time Lecturer in Economics and Statistics at The College of The Bahamas. Mr. Rolle has earned the right to use the Chartered Financial Analyst (CFA) designation. He holds graduate degrees in Economics from the American University in Washington, DC, and Carleton University in Ottawa, Canada. He is also an undergraduate of the University of Western Ontario, Canada and The College of The Bahamas.